- The first letter in every sentence is capitalized automatically. While capitalizing the first letter in every sentence is a common writing style for most European languages, it doesn’t always apply to what you might be writing about. Instead of having to undo the capitalization that Word “corrected” for you, you can turn this feature off so that you control when capitalization occurs. Go into Tools | AutoCorrect | AutoCorrect | Uncheck the "Capitalize first letter of sentences" box. 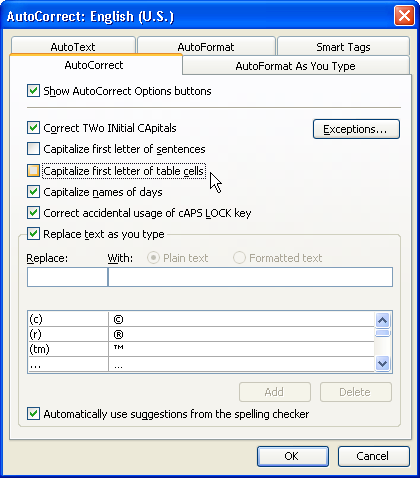 Go into Tools | AutoCorrect Options | AutoCorrect | Uncheck "Capitalize first letter of sentences" and "Capitalize first letter of table cells". Go into the Office Button | Word Options | Proofing | AutoCorrect Options | AutoCorrect | Uncheck "Capitalize first letter of sentences" and "Capitalize first letter of table cells". - (c) is changed to © automatically. Depending on how you create lists, this may be the worst feature ever, or simply a handy way of adding a copyright symbol. Go into Tools | AutoCorrect | AutoCorrect | Select (c) in the list of replacements and click Delete. Go into Tools | AutoCorrect Options | AutoCorrect | Select (c) in the list of replacements and click Delete. Go into the Office Button | Word Options | Proofing | AutoCorrect Options | AutoCorrect | Select (c) in the list of replacements and click Delete. 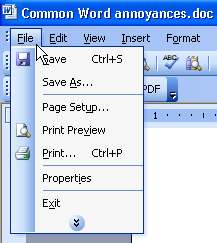 - Word hides menus you don't use regularly. This feature is called "Personalized Menus and Toolbars". If you hadn't noticed, Microsoft Word has a lot of menus, and buttons, and options, and checkboxes… (You get the idea). Rather than design a GUI that exposes the options more logically (Like the ribbon does in Word 2007), earlier versions of Word just hide the items you don't use to help you ignore their existence. Go into Tools | Customize | Options | Check "Always show full menus"
There isn’t any need, as Word 2007 doesn’t have “Personalized Menus and Toolbars”. - Word makes numbered lists automatically. If you start off a line with "1." or "1)", Word by default will automatically start a numbered list for you. Typically this formatting looks good inside of Word, but it can have unpredictable results when copied and pasted outside of Microsoft Office. Go into Tools | AutoCorrect | AutoFormat As You Type | Uncheck "Automatic numbered lists"
Go into Tools | AutoCorrect Options | AutoFormat As You Type | Uncheck "Automatic numbered lists"
Click on the Microsoft Office Button | Word Options | Proofing | AutoCorrect Options | AutoFormat As You Type | Uncheck "Automatic numbered lists"
lifehacker.com: Make Microsoft Word less annoying. windowsdevcenter.com: Top Ten Word Annoyances. 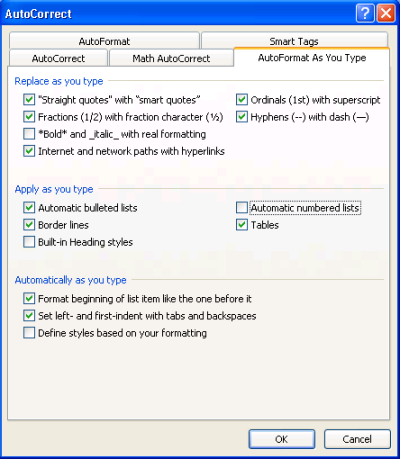 support.microsoft.com: How to turn off AutoFormat features in Word 2002 and in Word 2007.